Margaret with husband Eugene Bielawski at their Napa home, 1957. 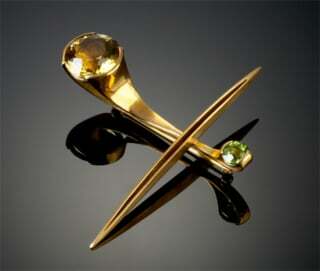 Pin (gold, topaz, peridot), 1960. 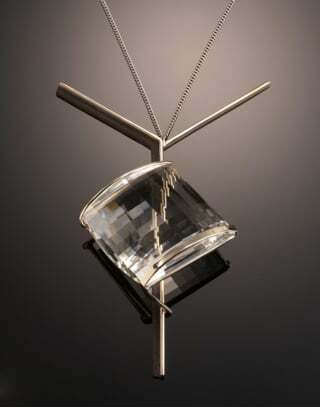 Pendant (white gold, ebony, faceted quartz), 1959. "People bought them and were expecting something lesser, something manufactured," Cabella says of some buyers. "There were major manufacturers who made jewelry so perfect there was no hint that it was made by a human. Hers were all handmade, hand decorated. People didn't like to see the touch of the artist." Cabella says De Patta's work sold well in San Francisco, where people were more open to modern jewelry. Many buyers would custom order brooches or rings, answering De Patta's detailed questionnaires to make sure the finished product would please. De Patta tried other endeavors—a line of inexpensive costume jewelry that did not sell, and designs for a silverware competition. She spent hundreds of hours on the designs, biomorphic sculptural objects that would be comfortable and functional. "Her designs were so far out, of course, they couldn't win the prize," Martha Bielawski says. Still, De Patta and Gene Bielawski made a living from the business, traveling to Japan in 1959 and entertaining in their Napa home, attracting artists and intellectuals from throughout the Bay Area. They also experimented with other art forms, creating light shows by rotating colored cellophane panels before beams of polarized light. "Pre-psychedelic is what it was," Martha Bielawski says. 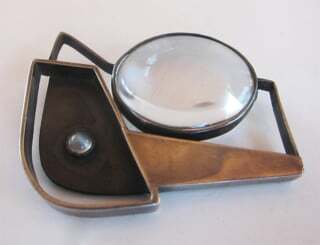 In 1957 De Patta and Gene closed Designs Contemporary. "Both begrudged the time spent on business and technical details," the Christian Science Monitor reported in 1959. De Patta "turned to experimentation with jewelry," and lectured and taught, while still producing "rings, pins, and earrings in limited amounts for sale in retail shops." Although De Patta was growing increasingly deaf, she took up playing Baroque music on the recorder, exchanging jewelry for lessons. She also stepped in to help when her friend Marguerite Wildenhain, the ceramicist who'd run a school at Pond Farm in rural Sonoma, was threatened with eviction. Along with others, De Patta lobbied successfully for the state to acquire the site as parkland and provide Wildenhain with life tenancy. The Bielawskis themselves were having house and money problems. They tried to sell their Napa home, without success, and moved to a house in Oakland, which they shared. "De Patta was frustrated and angry at the failure of her jewelry to sell," Ursula Ilse-Neuman, curator of a 2012 exhibit of De Patta's work, has said. 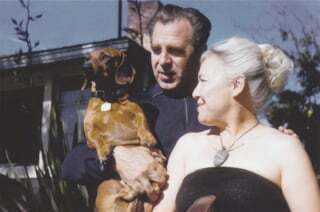 De Patta suffered from depression, and she and Gene had marital problems. Merry Renk, fellow jeweler and a longtime friend, said De Patta simply did not like getting old. De Patta took her own life on March 19, 1964, the day after her 61st birthday. "As we grow older," Philip Morton, a well-known jeweler and a friend, wrote to Gene, "we realize that the most enduring part of life is the passing moment when we are totally absorbed in the activities which we love best. From this standpoint, no one lived more completely than Margaret."